Here’s a look at the critical parts that make up the Kinect sensor for Xbox 360. Three-dimensional sensors track your body within the play space. An RGB (red, green, blue) camera helps identify you and takes in-game pictures and videos. An array of microphones along the bottom front edge of the Kinect sensor are used for voice recognition and chat. A mechanical drive in the base of the Kinect sensor automatically tilts the sensor head up and down when needed. Why does my Xbox 360 Kinect sensor tilt? Xbox 360 E console: The Kinect sensor has an attached cable that plugs into the orange AUX port on the back of the console. Do not plug this cable into a USB port. Xbox 360 S console: The Kinect sensor has an attached cable that plugs into the orange AUX port on the back of the console. Do not plug this cable into a USB port. 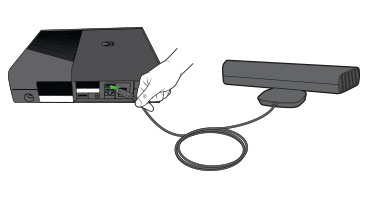 Original Xbox 360 console: You need to attach a power/USB cable to connect the Kinect sensor to your console. Learn how to connect the cables. Would you like to contact Support regarding the "Kinect sensor for Xbox 360 components" issue you were reading about or a different issue?